The all-in-one cooking bible for a new generation with 300 recipes for everything from simple vinaigrettes and roast chicken to birthday cake and cocktails. For Alex Guarnaschelli—whose mother edited the seminal 1997 edition of The Joy of Cooking, which defined the food of the late twentieth century—a life in food and cookbooks was almost predestined. Now an accomplished chef and author in her own right (and mom to a young daughter), Alex pens a cookbook for the way we eat today. For generations raised on vibrant, international flavors and supermarkets stocked with miso paste, harissa, and other bold condiments and ingredients, here are 300 recipes to replace their parents’ Chicken Marbella, including Glazed Five-Spice Ribs, Roasted Eggplant Dip with Garlic Butter Naan, Roasted Beef Brisket with Pastrami Rub, Fennel and Orange Salad with Walnut Pesto, Quinoa Allspice Oatmeal Cookies, and Dark Chocolate Rum Pie. "Alex is an extraordinary cook, whether in her restaurant or at home cooking for her daughter. You'll find gems to return to again and again in this wonderful new collection of recipes." "Alex is a one-of-a-kind cook, seamlessly weaving her expert cooking tips into one dream sequence of recipes that you absolutely must have." "It's a quirky, comforting collection that aspires to be a Silver Palate for a new age, the kind of reliable resource you'd turn to again and again." 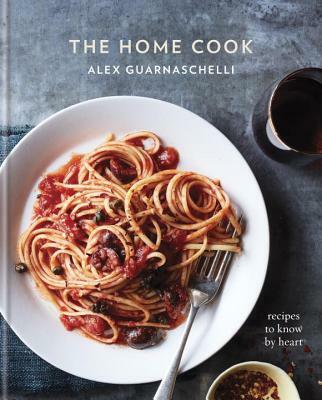 "Unlike many cookbooks by star chefs, Guarnaschelli's book is extremely approachable. The recipes don't have a long laundry list of ingredients, and the directions are clear and detailed."